Kinney County Jail Brackettville Texas. Kinney County's first jail, a small square simple stone structure built by James Cornell in 1873 and torn down in 1922, stood across Ann Street on the courthouse grounds, where the flagpole now stands. This second county jail was accepted by the commissioner's court on January 20, 1885 and was at the time the finest stone building ever constructed in Kinney County. 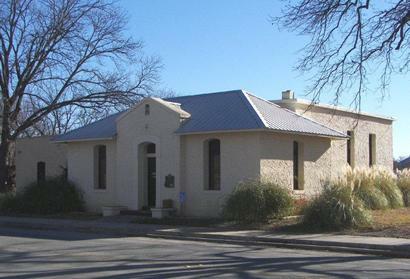 The gothic revival style building was designed by the architectural firm of Wahrenberger and Beckmann of San Antonio and built in 1884 of ashlared limestone blocks by John Waite at a cost of $16,000. The jail was remodeled in 1936-37 including removal of the second story due to structural damage from a series of disastrous storms. This durable building served as the county jail for 91 years, until 1976, when it was replaced by the law enforcement complex on North Street. Subsequent uses of the building include a dental clinic and the county nutrition center. Texas is very proud of its jails and Kinney County is no exception. 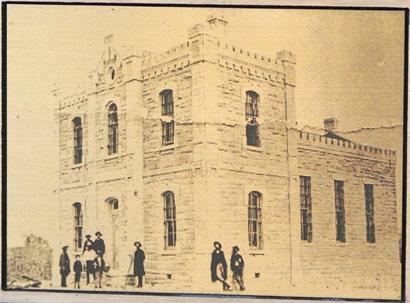 The plaque includes this picture of the old county jail in its original condition.